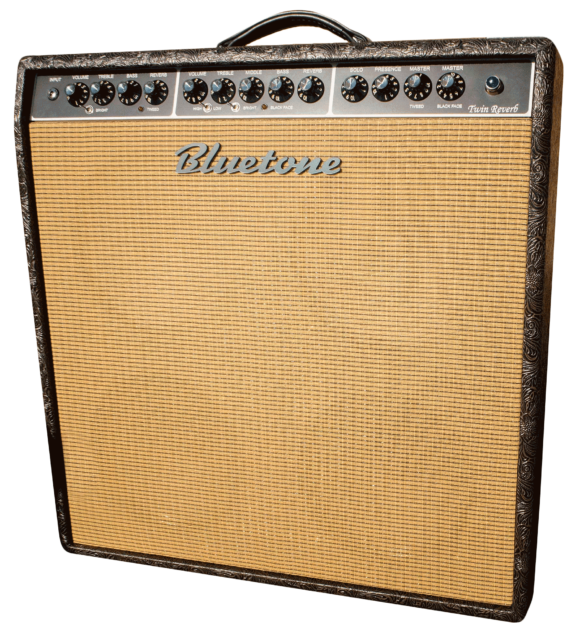 Our new 4×10″ Bluetone Twin Reverb combo is ready now. This two channel full tube amp has one channel with modified low power Fender Tweed Twin 5E-8 circuit and the other channel our Black Prince/modified Fender black face circuit. It has independent Spring reverb and master volumes for each channel. Add on is a common, adjustable Clean-/ Solo boost. Cathode biased power amp gives output power some 12-14 W with 2x6V6GT tubes and 28-30 W with 2x6L6GC/EL34 tubes. It`s power amp takes all normal octal power tubes. There is no need to bias them. Channel, Reverb and Solo Boost switching works with a 3 button footswitch. Amp cabinet is of light weight Paulownia and Poplar veneer. Amp total weight is only 21,7 kg, which should be the lightest in the world for this kind of full tube combo. Speaker combination is 2×10″ WGS Veteran+2×10″ WGS Green Beret. These prices include 24 VAT and are subject to change without notice.